It's true, Bennington Pontoon Boats' best kept secret is out. The 2018 Bennington G Series is here and it carries with it our tradition of extraordinary performance and superior craftsmanship. From bow to stern, the 2018 Bennington G Series allows you to customize your pontoon boat for the perfect boating experience. 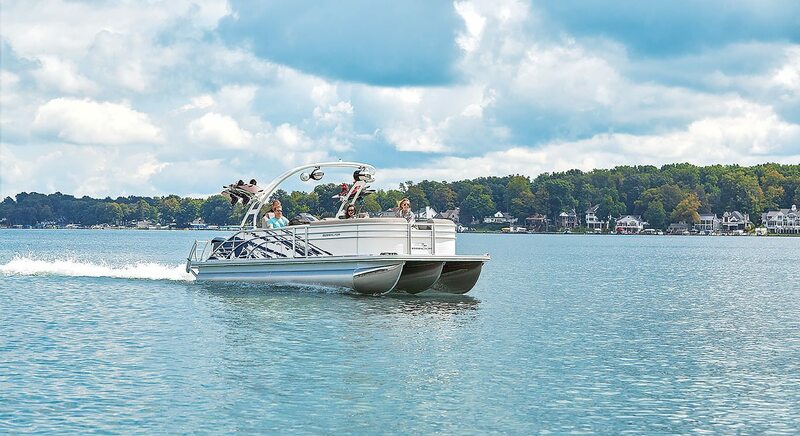 Available in 18-foot to 25-foot options, this line gives pontoon boaters style and quality at an affordable price. Beginning with the stern lounger, the G Series features pillow-top upholstery in Glacier White with Carbon accent and Diamond Stitching. At midship, the raised helm showcases Zebrawood accented trim and Seagrass Slate flooring. Bennington's offering of premium add-ons and customizable features put pontoon boaters in control. The jaw-dropping portside bar dazzles guests with perimeter lighting and an on-deck sink, while the optional starboard galley makes lack of storage a thing of the past. Custom layouts and Bennington's signature Blue Ice lighting accents will have you ready to host family and friends long after the sun goes down. For cruising and fishing, the G Series packs a punch, delivering functionality without sacrificing comfort. The stern fishing station is designed with ample seating for entertaining but quickly becomes your command center when the lines are cast. With integrated rod holders, 360-degree swiveling deluxe bass seats, and a live well, your fishing trip just became a fishing experience. Make it a full day on the lake with storage for your rods when not in use, the sun pad lounge with a pop-up privacy enclosure, and illuminated speakers to set the mood or bump the tunes. It's no secret that when it comes to luxury on the high seas or comfort on a calm lake, no one does it better than Bennington. Start designing your dream Bennington Pontoon Boat today at our online design center, here you can hand select each and every feature for the perfect boating experience.